No one wants this to be descriptive of their life, yet so many of us spend so much time here. We want to grow. We want to improve. Yet, we often find ourselves fighting the same battle over and over. Never really improving, just working hard to keep from slipping into the shadowy side of ourselves. 1) We stop doing things that are bad for us. 2) We start doing things that are good for us. It really is that simple. So why do we have such a hard time identifying the things that are bad for us? And why do we have such a hard time doing the things that are good for us? Sometimes... it's because we aren't willing to listen to the right people. Proverbs 27:6 says: Wounds from a friend can be trusted, but an enemy multiplies kisses. All the people in your life fall into four categories, defined by two questions. Are they more likely to compliment you or criticize you? Do they more likely love you or love you not? 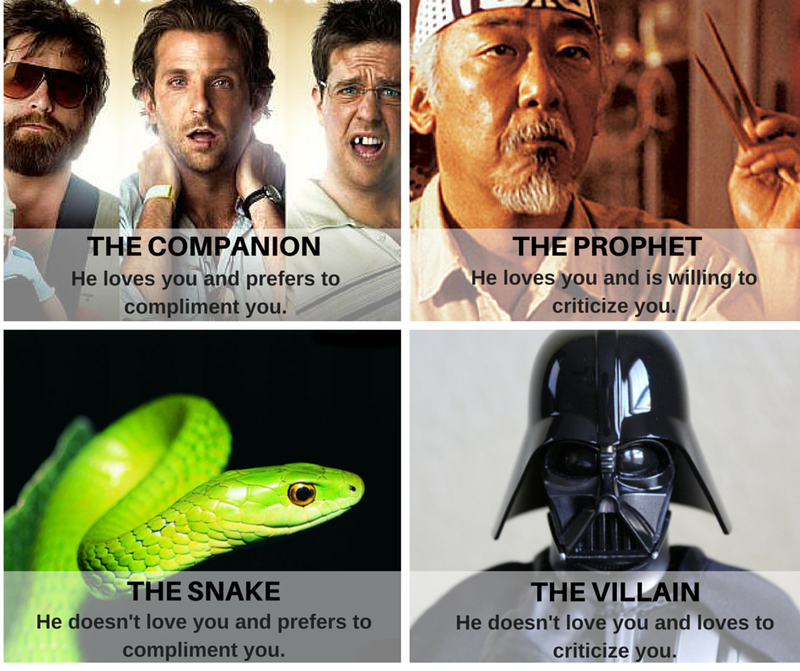 Those who do not love you and are more likely to criticize you are the villains in your life. They make you feel bad. They provide no benefit. You are better off without them. Wisdom invests little to no energy in those relationships. Those who do not love you and are more likely to compliment you are the snakes in your life. They are the most dangerous people you can know. They flatter you and make you feel good, but they are only laying a trap or building their own kingdom. You must learn to recognize these people and not be taken in by their smooth talk and tempting adulation. A wise man is not deceived by the seductive compliments of those who do not love him. Those who love you and are more likely to criticize you are the prophets in your life. They are the most beneficial people you can know. Their words may not feel good initially, but their instruction has the power to help you grow. You may not want many prophets in your life, but everyone needs at least one. Wisdom is imparted to us by those who lovingly criticize us. To whom are you more willing to listen? Most of us prefer the companions. They love us. They tell us what is good about us. They assure us that we are doing okay. Too often I've observed people swayed by the snakes. Unwilling to look behind the curtain of flattery, they blindly swallow the sugary words endorsements until it is too late, they are overcome by treachery, and they find themselves far away from life's best path. The reason we don't grow more is because we don't listen to the prophets! No one wants to be criticized, but sometimes criticism is incredibly necessary. Physical trainers often say that "pain is just weakness leaving the body." Criticism is sometimes painful. It might be suggested that loving criticism enables weakness to leave the soul. Remember the formula for growth? How can you know what bad things to get rid of in your life if no one will tell you those things? How can you know what good things you are neglecting if no one will tell you those things? Not long ago, I had a friend serve as a prophet for me. He had noticed something in my life that wasn't completely healthy so he sat down with me and pointed it out. It wasn't really a big deal, just a minor tweak that would enable me to grow. He gave an example of how he saw it playing out, and then suggested some positive steps I could take to create improvement. In a short conversation he had provided for me the two steps I needed to grow. He showed me a bad thing to stop doing and he suggested some good things for me to start doing. It wasn't the easiest thing to hear. But since I know he has my best interests at heart; I recognized this as beneficial criticism. I had two choices. I could ignore him and offset his criticism by replaying in my mind all the good things people had said to me in the past week. Drowning his criticism in the flood of platitudes offered by companions would certainly have made me feel better. Or, I could choose to hear and apply his criticism. Only the second choice would lead to growth. Maybe it's because you aren't listening to the prophets in your life. If you truly want to identify the harmful behaviors in your life, you'll need to find a friend who will point them out. Loving compliments are good and necessary. But like a diet of steak without vegetables, the long term implications are unhealthy. Find yourself a prophet. Even if their words for you are somewhat bitter, you'll be better for it. Read more about the danger of flattery here. 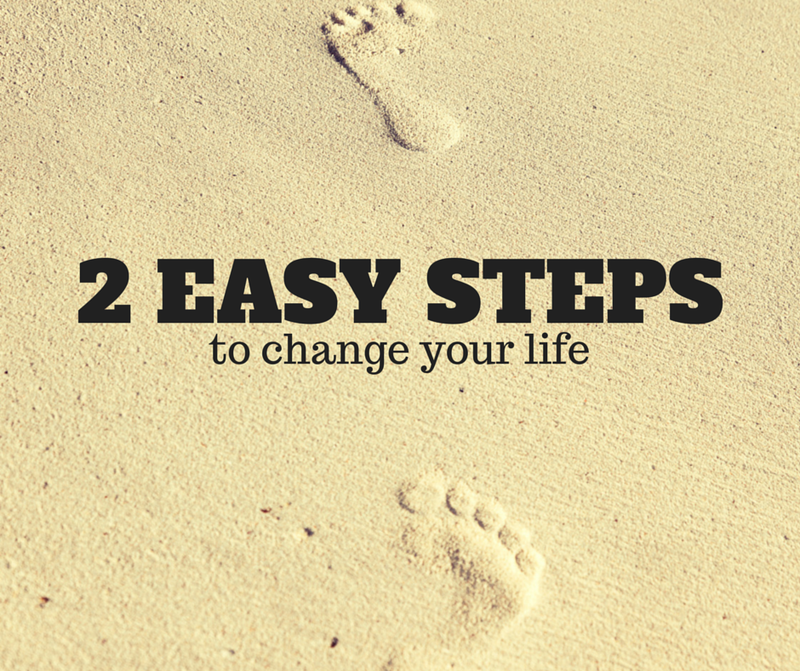 Read more about the 2 Easy Steps to Self-Improvement here.